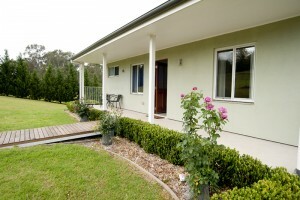 Only a few minutes from Kurrajong Village, nestled in a picturesque green valley, we have the perfect getaway! A romantic weekend together, time with family or friends, a break from it all, you will be enticed by the settings to simply put up your feet, sit back, relax and just love your time away. Take a stroll together, feed the sheep, meet the young lambs and kid goats, Look out for the lovely birds and watch the ducks land with a splash. If you like to take a short drive, we are just 10 minutes from your fruit picking experience, one the whole family will love. Venture a little further to Wisemans Ferry or head out to the Blue Mountains Botanic Garden at Mount Tomah. 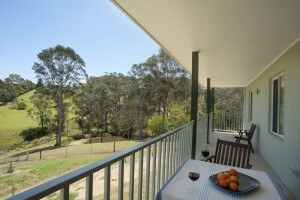 Retreat together, enjoy sweeping mountain views from your balcony. 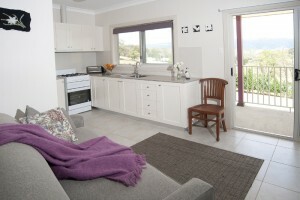 You will be enticed by the setting to put up your feet, sit back and just love your time away! You might like a stroll, feed our Merino or Suffolk Sheep and Angora Goats. Listen to the abundant Birds unique to Kurrajong, like the Whip, Bellbird and Bower Birds or maybe you like to take a scenic drive along the Bells Line Of Road for freshly picked fruits. We have the most amazing sunsets from our Cottage Balconies which is just part of your experience here with us at Highfields Country Cottages. The lustrous night skies make star gazing a necessity and the mountain views together will make your chilled wine more appetising. Enjoy mountain views from your balcony!